Speed reading can dramatically cut down the amount of time it takes a student to read books, notes and other materials for their classes. But, reading fast does not always mean reading well so students who have trouble reading for meanings or understanding vocabulary should not attempt to speed read before they feel confident with their everyday reading abilities. While not all students who wish to speed read will be able to become genuine speed readers overnight, there are some steps that they can take to increase their reading speeds. Pre-reading, using a pacer, using a block and practising with timed reading are common ways by which many students learn to increase their reading speeds. 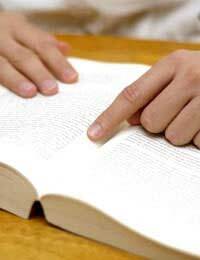 Pre-reading is a technique that is also sometimes referred to as skimming. During pre-reading a student quickly glances over the material to be covered and gets a feel for the important sections that they should read with more concentration and the sections that they can read briefly or skip. While pre-reading does not necessarily help a student read every word on every page at a faster pace, it does help students organise and prioritise their reading which often helps them get through defined chunks of reading (chapters, pages, etc.) more quickly. Some students find that using a pacer while they read can help their eyes move across text more quickly. Common pacers would be their fingers or bookmarks which can be used to draw their eyes either across a line of text or down a page of text. The general theory of pacers is that the more quickly the pacer moves across a page the more quickly the student's eyes will move as well. However, when students start reading with pacers they are very often so intent on their speed of reading that they neglect how well they are actually reading and learning. Practising using a pacer with leisure reading is a good idea before using a pacer with schoolwork and assigned reading. Many students find that they re-read things multiple times and that going back to previously read words, sentences and even paragraphs can greatly slow down their reading speeds. To avoid re-reading, some students use a block such as a bookmark or index card to cover the text that has already been read. Using a block can also help students focus since they won't be "allowed" to re-read the same information multiple times. Again, it is a good idea to begin reading with a block while reading for leisure rather than jumping in to schoolwork and assigned reading before a student may be comfortable doing so. The more students practice speeding up their reading the more they should be able to see these speeds increase. Practising timed reading, on everything from the morning paper to magazine articles to online columns to textbooks and class notes, will usually help students identify where they lose speed and how they can rectify these problems. Charting out their progress can also help students stay focused on their reading speed and motivated to make consistent improvements. Speed reading is one way that students can decrease the amount of time spent on homework and assigned readings. Pre-reading, using a pacer, using a block and practising with timed reading are all ways in which students can attempt to increase their reading speeds.